You can take the girl out of France, but you can't take the French out of the girl! Two opportunities will be drawing me back to France this year - an artist residency in Hyeres on the Cote d'Azur (!) 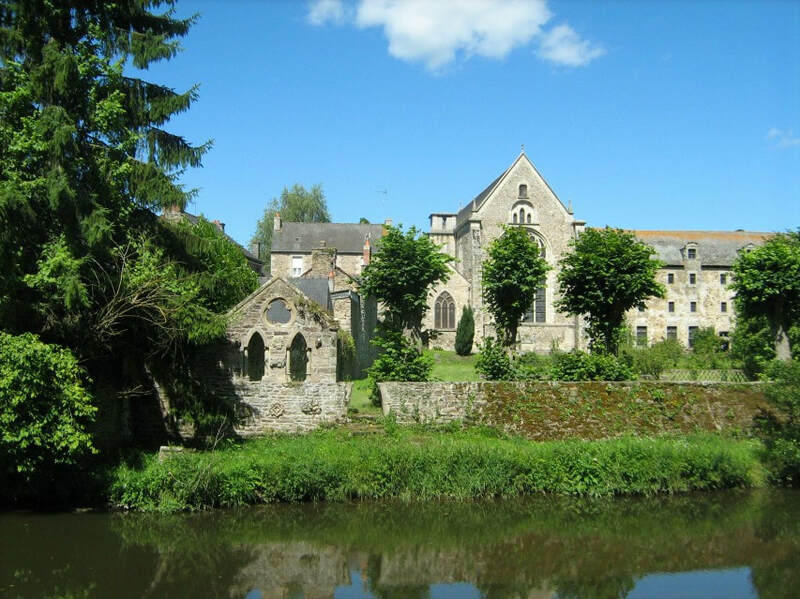 for the month of July and in addition, I will be participating in an exhibition at the magnificent Benedictine abbey (pictured left) in Lehon in September. Details forthcoming. The Clay Studio, a leading light in the ceramic arts, features an annual exhibition of small ceramic works no larger than 4" x 4". The show showcases selected ceramic artists in a variety of styles. It is fascinating to see how much punch small works can pack. My ceramic sculpture, Collateral Damage (left), will be exhibited in this year's juried exhibition. I uploaded an image of one of my works onto The Big Picture Collective because I believe in their mission - bringing together thousands of artists from all around the world to create a humongous mosaic picture that reflects our multi-cultural world. It is totally cool - check out where my work fits in the Big Picture here. 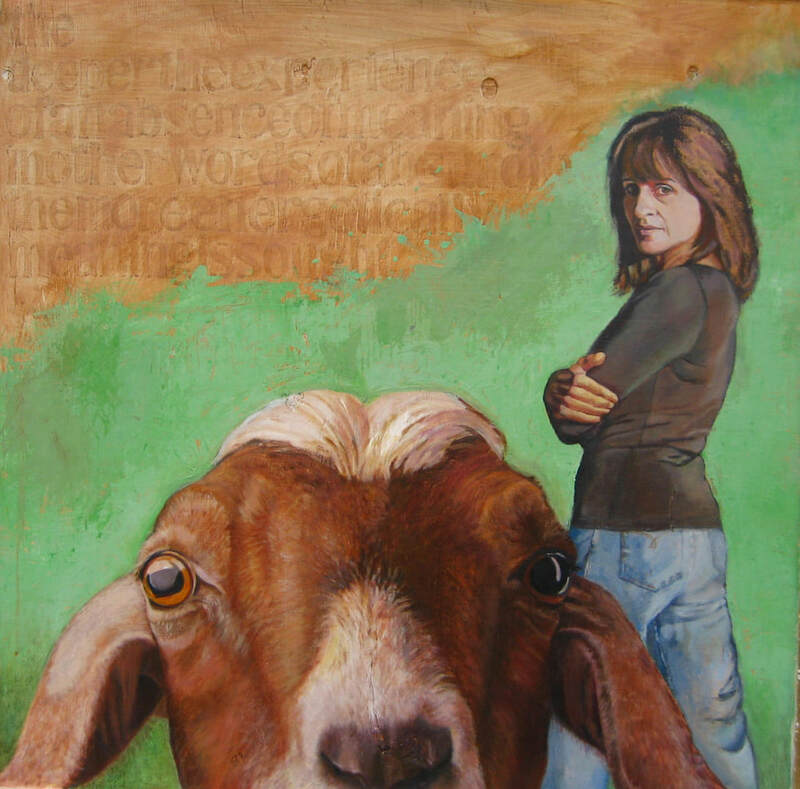 I thought I had done my bit but then I received word that my image, Self Portrait with a Goat (left), was selected out of hundreds of entries for the Speedball Art Prize! 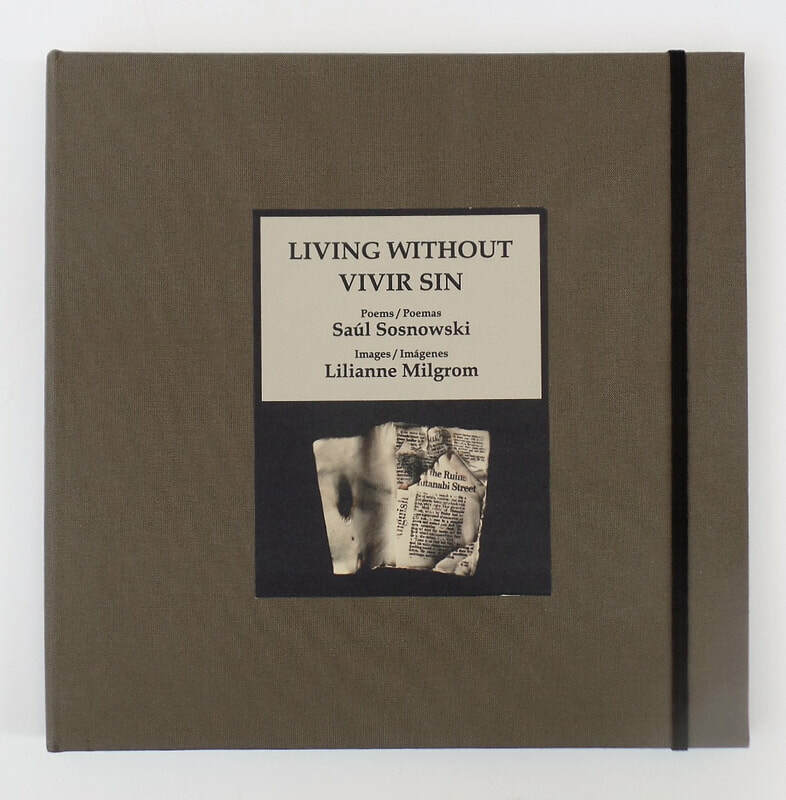 poems written by Saul Sosnowski in response to ceramic books from my installation Living Without Them. This collaborative project is now commemorated in print, designed as a folio of removable sheets with poems and images from the multi-media exhibition. Learn more here. 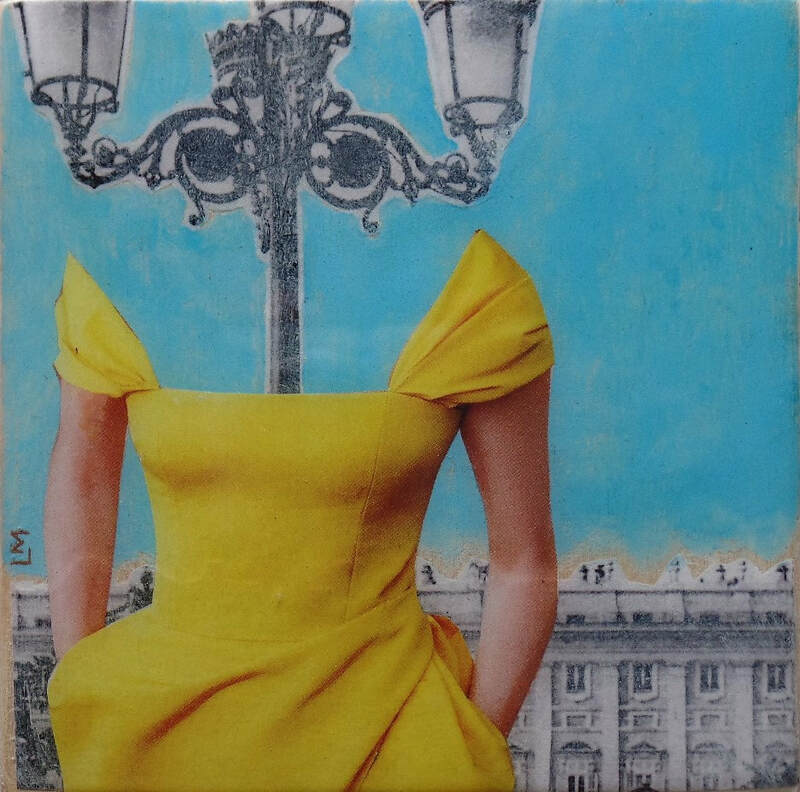 Western Wyoming Community College exhibited my French Girls mixed media series in a two-woman show with collage artist, Lili Francuz. It was a pleasure to teach a 3-day intensive workshop on collage technique in conjunction with the show. Collage is one of the most democratic of mediums requiring at its very basic, a pair of scissors, glue, and found scraps of paper. Picasso and Braque were the first artists to use pre- existing materials in their art. ​ It's always a good feeling to be able to help the community in my capacity as an artist while at the same time advancing my career. In this case, I also have the honor of being selected and recognized by one of the leading national galleries known for showcasing ceramic art. My sculptures were inspired by my readings I translated from page to clay. The interweaving of figurative human elements and representatives from the natural world may appear whimsical at first glance. Upon closer inspection however, one can discern an underlying darker narrative. They are the antithesis of the smooth and shiny figurine tradition. I was fortunate enough to experience a stunning exhibition at Stockholm's Artipelag Museum last year: 'Morandi/Edmund de Waal'. Everything about this exhibition was designed to inspire stillness, encourage contemplation, and amplify the sounds of silence. To experience the Morandi/Edmund de Waal exhibition was to divorce oneself from the chaos of the modern world. ​ My featured review of this exhibition has been published in Ceramics Monthly, the leading magazine on the ceramic arts. Read the article here. For over 30 years, North Light Books has been the trusted resource for artists seeking instruction, inspiration or motivation. 'Le Rouge et le Noir' from my Summer in Paris exhibition has been selected for North Light's 2018 edition of 'Acrylic Works', featuring the best of acrylic paintings. Southwest Art Magazine is a partner. ​ Copies can be purchased through their website. I am constantly creating in the studio, either focusing on a body of work destined for exhibition, experimenting with new techniques, or simply creating work inspired by current events or personal experience. I want to welcome you into my studio by sharing new works on a rotating basis. This month's spotlight features a piece from a series of mixed media (photo transfer, painting and collage) on wood. See more works like these here. I recently exhibited these works in a show in Wyoming. ​Comments or inquiries are always welcome through the contact form.